To enter an export market, the stages of export business and Export Market Entry Requirements (PMPE) shall be considered. 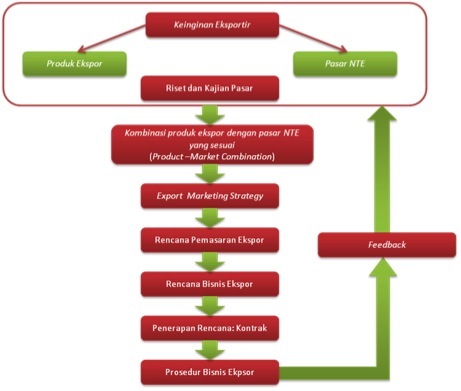 To be able to determine the Export Destination Country (NTE) which is suitable for product export, analysis is required in advance so that exporters can avoid the losses that may arise from unconformity of export strategy. The followings are the steps to be done in order to determine the Export Destination Country as well as its strategies. Exporters conduct research and market studies, market studies can be performed using the available literature, then the analysis can be performed using SWOT Analysis, which is a method in form of matrix that compares weaknesses, strengths, opportunities and constraints that arise from a combination of export products with export destination country. After conducting studies, it will result in a combination of product-market which is considered suitable by the Exporter. After further targeted, the Exporter then can begin to determine the feasible export business procedure, which includes export financing, export procedures and export payments. If this strategy is deemed less profitable then the Exporters can review where the fault is, thereby determining the export strategy will be further optimized that it will minimize financial loss. By performing the prior analysis to product being offered and its export destinations, it is expected to strengthen the exporter planning process in case of financial planning and marketing planning, so that exporters can avoid unnecessary costs.